A very cold and wintery start to the month, but Maureen and I enjoyed a family birthday on the first day followed by a day in Manchester on the second. This was somewhat of a trauma as we were travelling by train and it was one of those days when the weather disrupted all public transport. I am so glad to have retired from work in the transport sector and therefore could not be held responsible for such disruption. Tuesday 6 March and in the afternoon, I travelled to Westhoughton in the company of Keith Kemp and Barry Fitzgerald. I was attending a meeting of St James Lodge No 8910 meeting at the Masonic Hall, Peel Street, Westhoughton. It was a regular meeting and the master of the lodge John Riley was conducting an initiation ceremony. Tom Grimshaw was joining our Masonic family this evening. 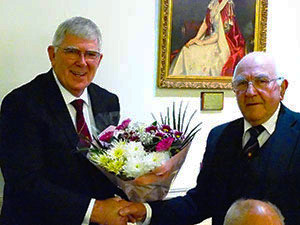 St James is also the lodge of Peter Allen, this year`s Provincial Junior Grand Warden and the Vice Chairman of Chorley Group of Lodges and Chapters. The reason for my visit was twofold. I, together with many members of the Provincial team went to thank Peter for his unstinting work as Junior Warden of the Province; a very hard but most rewarding year. In addition, we had an opportunity to witness the commencement of a young brother`s Masonic journey. It was an excellent ceremony witnessed by some 65 members of the lodge and their guests. It was most gratifying to attend and a wonderful opportunity to meet with many brethren within the group. Another wonderful meeting and a great start to this month of March. A happy and enjoyable meeting at Dalton in Furness Chapter. The next day, after a morning of dealing with many emails, I set forth for the outer reaches of our Province and to the Furness and South Lakeland Group. My destination was Fairfield Hall, Barrow-in-Furness for the installation convocation of Dalton-in-Furness Chapter No 6828. I was welcomed by over 70 companions of the group, who joined us for this meeting and to witness a most dignified and sincere ceremony of installation. I was accompanied by Chris Butterfield and Paul Hesketh together with David Barr the Provincial Grand Scribe Nehemiah and many acting Provincial grand officers. I had a most enjoyable time meeting with many old friends and was delighted to receive a wonderful donation to the MCF 2021 Festival. Following an excellent banquet, it was time to return around the bay to Morecambe. Flowers for Maureen from the Chapter of Fidelity. 8 March was a beautiful sunny day, but there was no time for walks, as I had a lot of paperwork to deal with before setting forth to Poulton-le-Fylde for the installation convocation of Chapter of Fidelity No 1256. A very well supported installation with some 70 companions in attendance. I was accompanied by David Randerson, Stuart Thornber and Ian Ward together with Neil MacSymonds, acting in his role of PrDGDC. It really was a marvellous ceremony, so well done to all who participated in the work! Following the meeting I was introduced to many companions whom I had not met before, by the chapter DC Martin Dennison. We shared a pre-dinner drink before moving on to our dinner. I believe every word I uttered was recorded in the annals of Masonry by the South Fylde Group Publicity Officer Glen O`Brien and we were later enthralled by the singing of the ‘Three Principals Song’ by Hugh Mett, the North Fylde Group Publicity Officer. It was a good evening enjoyed by us all, I am sure. We now had time to enjoy a few days with no Masonic commitments. There was a surprise visit on Saturday evening as our daughter Tracey and her husband Peter, arrived from the Isle of Man. Sadly it was only a fleeting visit for Mother’s Day as they had to return to the island on Sunday evening. Maureen was thrilled to have them with us, albeit for such a short time. On the Tuesday of the following week, it was an early start as I had to catch the morning train to London accompanied by Phil Gunning, Peter Taylor, Neil Lathom, Geoffrey Bury and Paul Broadley. We were attending the Mark Grand Lodge Quarterly Communication along with many other brethren from the Province. We arrived in London in time to check into our hotel and then set off to Great Queen Street for the meeting at 2 pm. The meeting was not well attended but never the less we had a most enjoyable time followed by a rather crushed festival dinner in the new Connaught Rooms. Many brethren had travelled from West Lancashire to support the meeting. The next morning, after enjoying a full English breakfast we set forth to Great Queen Street for the special investiture meeting at UGLE for those brethren receiving appointment or promotion in grand rank as part of the tercentenary celebrations. Our three recipients were Peter Taylor, Neil Lathom and Godfrey Hurst. The support from West Lancashire was excellent as I was accompanied by Phil Gunning, Harry Cox, David Winder, Derek Parkinson, Kevin Poynton, David Grainger, David Walmsley, Peter Greathead, Neil Pedder, Andy Barton, Mark Barton, Geoffrey Bury, Paul Broadley, David Kenworthy, Ian Brown, Bob Tinsley, Steven Hogg, Bill Culshaw and Michael Radcliffe. I thank them all for their support of this great day and for those brethren receiving their grand rank. The temple was packed to capacity and two lodge rooms were made available to accommodate brethren who could not get into the main temple to watch the ceremony. They had to watch via a TV video link. Following a most interesting investiture, Grand Lodge was closed in due form and we all retired to various dining facilities before making our way home in the late afternoon. Another wonderful couple of days at grand lodges. Thursday 15 March was not a good day! Following a morning of getting some paperwork completed, I set off at 1 pm to travel to Blackburn for the annual Provincial Grand Chapter meeting of East Lancashire. The weather was not too bad, but it was raining, and a very cold wind was blowing. I travelled south down the M6, then just several miles past Lancaster services I had a front wheel tyre blow out. I was fortunate to be able to return to the hard shoulder but was stranded there for a couple of hours awaiting a breakdown service. They eventually arrived but as I was very wet and cold I decided to return home rather than travel on to Blackburn in a rather miserable state. I’m sorry to have missed what I understand to have been an excellent meeting. 16 March was a big day for Maureen and I, as this evening we were hosting the Provincial Grand Ball and Banquet at the Macon Stadium in Bolton. Staying at the Whites Hotel on site, we enjoyed an afternoon tea with many of the past Provincial Wardens and their ladies before attending the reception for the masters of lodges and first principals of chapters together with their ladies. It was wonderful start to what was to be a great evening. A fabulous night at the Grand Ball and Banquet. For just over an hour, Maureen and I were able to meet and greet so many brethren and their ladies who had not previously attended the Grand Ball and Banquet. Following this wonderful opportunity, we all went down into the ballroom area for dinner. Maureen and I processed into the arena with Phil and Anne Gunning, Paul and Wendy Renton, David and Janie Asbridge, Peter and Lesley Allen to the rapturous applause of over 400 brethren and their ladies, what a wonderful sight. I believe that all present enjoyed a most delicious meal which was followed by the ‘Grand March` which set the evening off in good style. We then enjoyed dancing to the band `Under the Covers` until the end of the evening, around midnight. Dancing went on in to the early hours for those who wished to stay for the disco. My grateful thanks to Tony Bent, Andy Wiltshire and all those brethren who worked so hard to ensure that we all enjoyed this wonderful occasion of the 158th Provincial Grand Ball and Banquet. Oh, what great night! Following a quiet and relaxing weekend, the following Monday I attended a meeting with Peter Taylor at the Provincial office. With John Murphy at the Garston Group dinner. Later that week, Peter Taylor, Keith Kemp and I travelled to Garston where we enjoyed their group dinner. 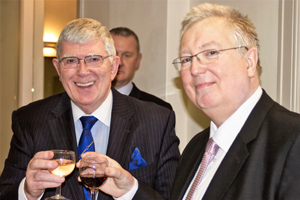 It was the first group dinner that John Murphy as group chairman had hosted and it was a great success. It was attended by many of the masters and first principals from within the Garston Group and we were joined by many other brethren. It afforded me a great opportunity to meet with them on a one to one basis and hopefully gave them the chance to ask any questions of myself or the other members of the Provincial team. I was accompanied by Derek Parkinson, Peter Taylor, David Asbridge, Peter Allen, Keith Kemp and Ian Halsall. It really was a splendid occasion. On 23 March, after a leisurely morning and afternoon I was off to Morecambe`s Masonic Hall in the evening for the enthronement meeting of Morecambe Rose Croix, where along with Philip Gardner, the Inspector General, we witnessed Ian Lonsdale placing Barry Robinson into the Sovereign’s chair. An excellent meeting, attended by brethren from many parts of the Province. Thursday 29 March, prior to the Easter break. I travelled to Leyland Masonic Hall in the morning for the installation meeting of St Molaise Council of Knight Masons. A new and very small council, only one year old and meeting here in West Lancashire. It was well attended by the knights of the council and we had a most enjoyable meeting with luncheon to follow. Well done Leyland, a very enjoyable lunch. I sign off hoping that the weather will be kind to us as it’s now time to enjoy a very happy Easter Holiday. I hope that you too will enjoy your spring break.